2012 г. – The Japanese producer of Teysuno Taiho Pharmaceutical and Nordic Group concluded an agreement for the commercialisation of the drug for the territory of EU as well as other countries. 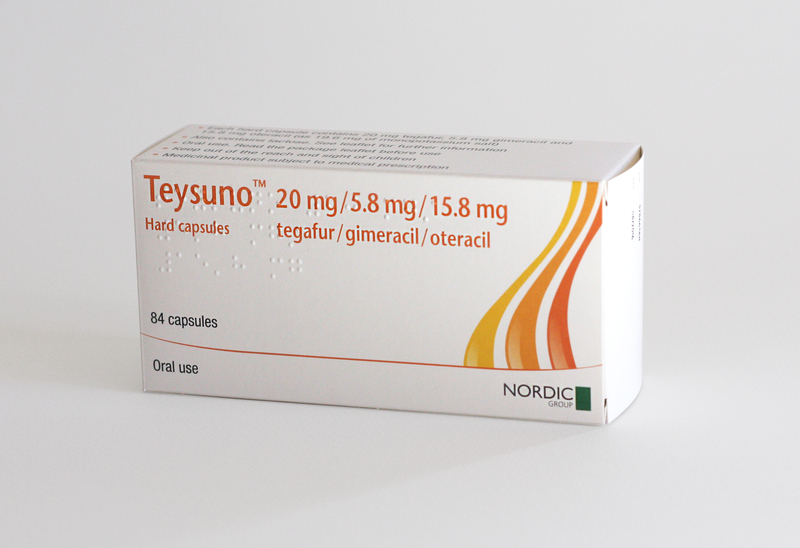 Teysuno – An original, innovative, oral antitumour agent for the treatment of advanced stomach cancer (difficult and unsuccessful to cure up to now), given in combination with cisplatin. Teysuno – 4th generation of oral fluoropyrimidin. Teysuno – prescription medicine, included in the Positive drug list in Bulgaria. Teysuno is 100% reimbursed by the state and is prescribed by a doctor-medical oncologist in accordance with the order defined by the National Health Fund for the respective oncological diseases (advanced stomach cancer). For more information you can address the specialists from the oncology network in the country as well as us. Teysuno – can be freely purchased with a prescription from any pharmacy in the country after an order to the drug distributors Novus Trading or Medex.